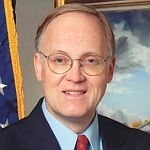 (HOST) Commentator and former Vermont governor Jim Douglas says new calculations suggest that health care costs are rising even faster than predicted. (DOUGLAS) The trustees of the Social Security amd Medicare programs recently concluded that the trust funds will be empty sooner than expected. For Social Security the projection moves the time frame up a year to 2036, but the stark reality for Medicare is much more serious: the fund will be able to pay full benefits only through 2024, 5 years sooner than last year’s projection. More troubling is the assertion by the program’s chief actuary that this date is likely optimistic, as it assumes the new Federal health care law will actually be implemented as passed. The actuary is skeptical because the reform act cuts fees to physicians, something the Congress has approved in the past, but always reversed. Before passage of the new law, the calculation showed that the trust fund dries up in 2016, just 5 years from now! It shouldn’t be a surprise. We’re getting older as a society, so more seniors will depend on Medicare for a longer time. We all want the best and the most in health care: new drugs are being developed that keep us going, but they’re not inexpensive. Modern technology presents new options for diagnosis and treatment that are costly as well. Defensive medicine encourages providers to ensure that every test has been conducted. The greatest percentage of health care costs is for treating chronic disease. Experts believe that obesity, which is on the rise, will soon eclipse tobacco as the leading preventable cause of premature death. A few years ago I launched the Fit and Healthy Kids program. It teaches schoolchildren to do 3 things: eat colorful foods, which are generally healthier; move their bodies more; and turn off the TV. That’s good advice for Vermonters of all ages. If we supersize everything at the restaurant, we’ll soon be supersized ourselves. Another factor in an aging society is caring for folks at the end of life. I’ve had an advanced directive for some time and I urge everyone to follow suit. We need to let our loved ones and health professionals know whether we want extraordinary measures when we’re terminally ill. Most don’t, but they need to say so ahead of time. There are steps we can take individually to stem the steady rise in health care costs, but Federal policymakers need to do their part. The House Republican proposal for a medicare voucher system has been criticized, but there have been bipartisan proposals that are similar, although less dramatic. Yes, a hefty increase in the Medicare tax could resolve the shortfall, but Congress needs to summon the courage to make some tough decisions and recognize that we can’t continue a program that’s growing unsustainably. They risk losing the program just when more Americans will need it. It’s been said that the Federal government is little more than a health insurance company with an army. Defense spending needs to be curtailed, but the largest and fastest-growing budget items are our huge entitlement programs. Will folks in Washington step up to the plate?